Home / Family / When a Person Dies, Who Does the Inheritance Go To? When someone dies, where does their money go? It’s an important question. Figuring out where an inheritance goes can be a difficult process, depending on the situation and what kind of instructions the deceased has left relating to their assets. What actually happens depends on the wishes of the person who has passed, tempered by state and local inheritance laws, as well as other rules. In many states, if there is a surviving spouse, most of the assets pass to that person, without probate, if the assets are owned jointly. In some cases, though, probate might be necessary even for spouses. Some bank accounts opened in the name of the deceased, but not jointly owned, might not have a beneficiary names. These assets end up going through probate. Additionally, if someone other than the current spouse is named as a beneficiary, it is the beneficiary that receives the assets. Joint assets pass on without being taxed in most cases. The government, of course, wants its cut. For estates of certain sizes, there are estate taxes, and in many cases the heirs pay inheritance taxes. Realize that there are federal taxes to pay, and many states also have their own taxes. These taxes can reduce the size of the estate before it is passed on to someone else. If a person dies owing money, then the estate is responsible for paying those debts. Assets of the estate might be liquidated in order to meet those obligations. If there isn’t enough money in the estate to go around, a judge might decide how much, and in which order, the creditors are paid. The assets that heirs receive are only divided up after the creditors have been satisfied. As a result, a great deal of debt can impact how much you leave to your posterity. The people named in wills, or listed as beneficiaries on different accounts receive their share of the estate when someone passes on. A will and other estate planning documents can be very useful in helping the executors of the estate assign assets. In addition to the information listed in estate planning documents, the beneficiaries listed on accounts also receive their share. It’s important to note that the beneficiaries listed on an account trump what’s in the will. So, if you make it clear in your will that your children should receive the benefit of your life insurance policy, but you haven’t removed your ex-spouse as the beneficiary on the policy itself, it doesn’t matter what your will says. Your ex gets the money. The same thing is true of retirement accounts and Health Savings Accounts and many other types of accounts. This is why it’s so important to review your beneficiaries regularly and make sure all of the information is up to date. You can choose to leave assets to organizations as well as individuals. It’s possible to leave a portion of your inheritance to a charity, your alma mater, or to some other organization. Because your inheritance can go to almost anyone, it’s important to think about how you will dispose of your assets when you pass on, including the legal steps you can take to reduce the tax liability of your estate. Get the help of a knowledgeable estate planning attorney and make an effort to use various tools to make sure most of your assets go where you want them to go. 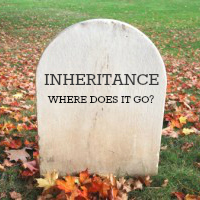 Are you dealing with inheritance issues or questions? Leave a comment! This article was originally published December 7th, 2012. 7 Responses to When a Person Dies, Who Does the Inheritance Go To? Wow, all this variability is a good reminder to keep all of my end-of-life documents in order as well as ensuring those I care about have theirs. You noted, correctly, that a designated beneficially of a retirement account takes priority over what the will states. Important to note, if you don’t list a beneficiary on a 401(k) or IRA, and it passes through the will, the beneficiaries don’t get the lifetime stretch option, but must withdraw over no more than 5 years. There are some tasks that are easy to get done in regards to estate planning. Be sure that your beneficiaries are up to date (check the paperwork on file with your HR department, for example). Choose a personal representative (new term for executor) that you trust. Be willing to serve as one for someone else. Be willing to discuss death and dying with your loved ones-even if you are not ready to do so. As long as your beneficiaries are all squared away, and your will matches your beneficiary information, there shouldn’t be a problem. However, you should work with an estate planning professional to make sure everything is in order. Let say, I arrange my wealth and assets to my trustee, How can I make it sure that my trust company or trustee will transfer to my beneficiaries as per my will? Where Will Your Money Go When You Die? It May Not Be Where You Would Hope… | Morris, Hall and Kinghorn, P.L.L.C.